Sophisticated even as it mocks the pretentiousness and inflated self-importance of those who profit from creative endeavors, Dan Gilroy’s “Velvet Buzzsaw,” which premiered Sunday at Sundance on its way to Netflix, is a deliciously vicious satire unafraid to use campy gore to assert its commentary on commodified art. An animated title sequence crafted to resemble moving oil paintings, perhaps a nod to what’s to come later, gives way to our first encounter with Morf Vandewalt (a fabulously wild Jake Gyllenhaal), a decisively flamboyant art critic whose opinions are weighted in gold. God-like power has been attributed to his reviews: his raves can increase the value of pieces, and he can ravage entire careers when vitriolic. Simultaneously loathed and revered, Morf has the ear both of prominent art dealer Rhodora Haze (Rene Russo) and Gretchen (Toni Collette), an LA art curator with intentions to dabble in the market herself. Yet, the self-serving, presumably bisexual, expert only trusts Josephina (Zawe Ashton, “Nocturnal Animals”), who’s currently a receptionist at Rhodora’s firm but clearly holds higher aspirations. Gilroy’s aptness for piercingly witty dialogue and morbid humor lace every one of the exchanges among these rabid purveyors and tastemakers. Morally repulsive characters also occupied his directorial debut “Nigthcrawler”; what’s changed here is the incorporation of a supernatural element not fond of these greedy antics. Reunited in service of the writer-director’s vision, Gyllenhaal and Russo reinvent themselves. This time out, his character is capable of remorse while hers stays affixed to her interests, even as appalling phenomena threaten her. Not long into the film, uproar pierces Morf’s privileged bubble when Josephina discovers numerous pieces by an unknown artist named Vetril Dease, who died mysteriously in her apartment building. With Morf’s help, Rhodora and Josephina (now business partners) amplify the reputation of the unknown master whose paintings depict unsettling scenes of violence. Demand is high, and the entire art world apparatus is ready to make a killing. But the more that’s unearthed regarding Dease’s past and inspirations, the higher the risk for anyone involved in his art’s commercialization of being punished by an otherworldly entity. Inventively, Gilroy utilizes exaggerated horror tropes to take to task our cynical thoughts about artistic creation. His sharp “Velvet Buzzsaw” is an exquisitely diabolical exposé on the merciless materialistic ambitions that run rampant in cultural fields. Bearing Gilroy’s signature, the film can also be described as an amalgamation of Ruben Ostlund’s “The Square,” the “Final Destination” series, and the Hungarian animated feature, “Ruben Brandt, Collector,” about a psychotherapist tormented by several paintings that come to life before his eyes in terrifying ways. Gyllenhaal’s Morf shares Ruben Brandt’s symptoms, since he also sees Dease’s tortured subjects menacingly jump from the canvas. “Critiquing is limiting and emotionally draining,” says Morf, hoping that Dease will allow him to surpass the barriers of his own perception when analyzing subjective material. Though Morf’s yearning may not be fulfilled, the highly quotable lines he unleashes make of the movie a prime candidate for a cult following. 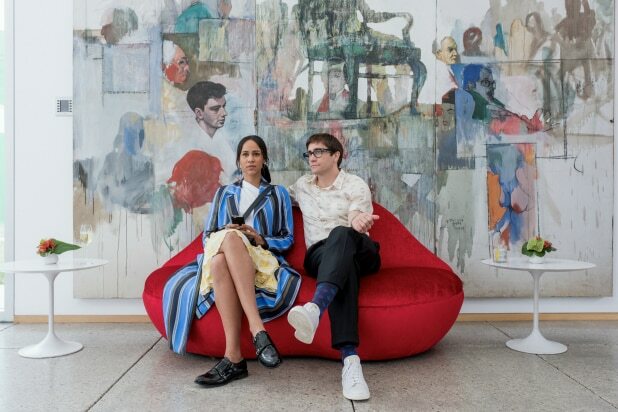 “Velvet Buzzsaw” is as lavishly produced as one would expect a film set in this ravishingly expensive underworld to be. Production designer Jim Bissell (“Surburbicon”) deserves special recognition for the fantastic recreation of spaces, the paintings at the center of the ghost-story plot, and other contraptions like the Sphere, a metal ball with multiple holes for the user to insert his arm and experience a variety of sensations — sometimes painful ones. Bissell presented cinematographer Robert Elswit (another “Nightcrawler” alum) with a colorful domain to capture, and their partnership results in a sublimely shot pastiche of which Morf himself would approve. Negative reviews eventually haunt Morf into self-destruction, and whether or not this is a cautionary tale for critics, reviewing a film about the act of observing, interpreting, and grading almost feels like winking back at Gilroy for pushing us to do so in the first place.